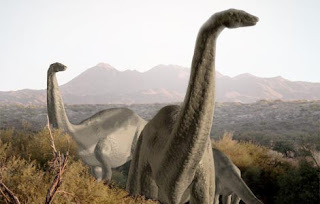 There is some debate as to what the largest dinosaur that ever existed is, but most now believe it to be Argentinosaurus, a long necked dinosaur from a group known as the Sauropods. As you can guess from its name, the remains of Argentinosaurus were dug up in present-day Argentina, in South America. The dinosaur lived on the then island continent of South America somewhere between 97 and 94 million years ago, during the mid Cretaceous Period. So far, researchers haven't found an entire skeleton, but what they have found, four-foot long vertebrae and five-foot-long tibias, indicate that Argentinosaurus was a truly titanic sauropod. So what are sauropods? Well, palaeontologists use the term to describe large, four-legged, plant-eating dinosaurs with bulky bodies, long necks and tails, and tiny heads with small brains (in fact, sauropods are believed to have been the least intelligent of all the dinosaurs). The name "sauropod" itself is Greek for "lizard foot," which oddly enough was among these dinosaurs' least distinctive traits! Interestingly, the remains of Argentinosaurus were dug up near the fossils of another huge dinosaur - the carnivorous Giganotosaurus. This has led palaeontologists to speculate that giganotosauruses may have hunted argentinosauruses in packs - a chase that would have been deadly for any smaller creatures that got in the way! In the BBC series, Chased by Dinosaurs, Nigel Marvin "travels back in time" to witness such a hunt. Click here to see an extract from this episode.